The threat for severe weather Sunday continues for parts of the Mississippi River Valley and the Ohio River Valley. The Storm Prediction Center has placed parts of Illinois, Indiana, Kentucky, Michigan and Ohio in a "Moderate Risk" for severe storms. They have also placed parts of Arkansas, Illinois, Iowa, Kentucky, Missouri and Tennessee in a "Slight Risk". The outlook covers the time from 7am ET Sunday through 7am ET Monday. The population bases within the different risks are pretty high. Seventy-six and a half million people live within the risk area. A little over 39-million people live within the "Moderate Risk" and another 37-million live within the "Slight Risk". Hopefully, people aren't taken by surprise with the potential for severe weather. November is not an unusual time for severe weather. In fact, it is the height of the secondary severe weather season for Ohio River/Mississippi River Valleys. Here is a look at the latest information from the RPM 4km high resolution computer model. 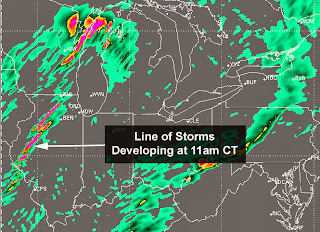 It suggests a line of storms begins to develop and quickly strengthen around 11am Sunday in northwest Illinois. If this holds true, this could start to bring the line in to the St. Louis metro area shortly before noon. 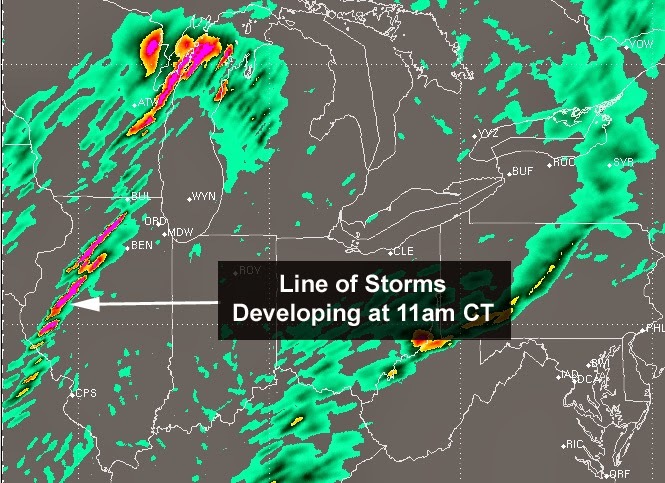 It would also bring a line of storms near the Chicago metro area around noon. The model also suggests the line of storms reaching central Indiana between 5pm and 8pm. IF a line develops further south in to Missouri, the model is suggesting it could start to arrive in southeast Missouri around 12pm-1pm. The line would continue to move east arriving at the Mississippi River (in southeast Missouri) around 2pm-3pm. The line mentioned above is likely a secondary line that will develop ahead of a cold front. Well ahead of the front there could be isolated to scattered thunderstorms later Saturday night through early Sunday morning (pre-dawn) in Missouri, Illinois, Indiana and Kentucky. There is enough instability to generate a few strong thunderstorms but I think the "main show" will be the secondary line. There appears to be plenty of instability within the atmosphere to get thunderstorms going. Here is a look at the CAPE's (a form of instability forecasters look at) from this morning's run of the North American Model at 12pm CT.
CAPES are anywhere between 500 and 1000+ joules/kg for anywhere from Michigan down through Arkansas. Also, if you step up to around 30,000 feet, there will be tremendous amounts of lift taking place due to divergence in the jet stream starting Sunday morning for areas west and southwest of St. Louis. Then by late morning a powerhouse jet streak will start to nose in to central Illinois and western Indiana. Winds will be moving along at 145mph out of the west at 30,000 feet. Further down the atmospheric column winds will be coming out of the southwest at 55-70 mph just 5,000 feet above the ground. This being the case, there will be lots of dynamic energy along with turning of the winds throughout the column. Any thunderstorms that get going can start turning quickly. I want you to note the probabilities put out by the Storm Prediction Center. Notice the large 45% probability through the Midwest. That doesn't mean there is a 45% chance of severe storms for that entire area, however it means that there is a 45% probability of severe weather occurring within 25 miles of any point within that area. of significant severe weather within 25 miles of a point. So what are the main threats? Right now, it appears that the biggest threat from thunderstorms will be strong, damaging winds. Also, I think there is a decent tornado threat with this setup. Especially the further north you go. For right now, lets say north of I-64 in Illinois in to Indiana. That means there will be a threat for tornadoes in central/northern Illinois, most of Indiana, southern Michigan and perhaps Ohio. Since this is a time of year when people aren't thinking about severe weather, make sure you have fresh batteries in your NOAA Weather Radio. Go over your action place with your family. What are you going to do/where are you going to go if a Tornado Warning or a Severe Thunderstorm Warning is issued? Finally, a lot of you ask about my "Freak-Out-Meter". What is the meter? It is basically a way for me to try to indicate how much I am concerned about the storm. Hopefully, for some of you that get freaked out easily from weather it is a way to calm your nerves but also a way for you to see how big of a deal this is. Keep in mind, this is on a scale from 0-10 with zero meaning I'm not concerned to a 10 meaning I'm beyond concerned.